Imagine Ramadan at your doorstep. The long anticipated first taraweeh prayer will take place tonight. You desperately want to feel the spirit. But you just aren’t into it. You’re overwhelmed with something else: distractions! You’re drowning in deadlines for work;you need to catch up with family issues that you’ve been postponing for ages. On top of all that, your social media feeds – this one thing that you depend on to de-stress – is draining rather than boosting your spirit. With minimal spiritual preparation under your belt and a sea of distractions swallowing you, you realize one thing: you’re not ready for Ramadan! If this sounds like the scenario you are facing this year, then it’s time you drop everything you’re doing, pause a little bit, and start to seriously and committedly plan for a healthier Ramadan journey. This is what we will attempt to discuss in this article, Insha Allah. Ramadan is our precious annual opportunity to draw closer to Allah . It’s filled with abundant chances to gain rewards as well as make positive changes that will benefit us far beyond those 29 or 30 days. To reap maximum benefit during Ramadan, we’re often advised to start building our spiritual momentum at least two months prior to the blessed month. We could focus on many areas to achieve that goal, but one of the most critical aspects that needs to be settled before any other planning is to eliminate, or at least minimise, our distractions. Time-wasters: Things you spend an unreasonable amount of time doing. Intense attachments: Things that consume your heart or mind so that even when you aren’t physically involved/acting on them, you think about them a lot, desire them intensely, and give them more mental and emotional focus than they are worthy of. Once you’ve analyzed the distractions, rank them and identify those that are most critical to address before this Ramadan. You may not get to everything on the list, but as long as you’re making an effort on some of them, you’re on the right track. Perhaps you’ve tried to give up that game before, only to fall back into the habit. Or you enforced social media restrictions, but slipped slowly until you were a regular user once more. Life is filled with such internal battles, and if we keep ‘failing’, it’s easy to lose hope. But a Muslim should never despair. A Muslim should always try to learn from his/her past experiences. So, for this step, think through your past ‘failures’ and try to figure out why things didn’t work out. When you eliminate or reduce time spent on a distraction, you free up space in your schedule, your heart or your mind. Leave that gap empty and shaytaan will fill it with something harmful or unproductive. So, find a good replacement which still fulfils that particular need. For example, if you’re spending long periods reading news websites and on social media – especially to avoid work or studies that you find boring, you clearly need something that will stimulate your mind. Before finding a substitute, remind yourself of why it’s important to get the dreaded task done, then break it up into small, manageable blocks which you can knock off in half hour slots. After that, look for interesting activities that will stimulate both your mind and soul in the short breaks between time blocks. For example, in one break, you could take a walk around the block making dhikr. In the next break, you may spend a few minutes reading a beneficial Islamic article. Take the time to map out all your options, then draw on that pool – and that pool alone – when you reach each and every break. But don’t limit yourself to ‘religious’ activities if you know they won’t be an effective substitute. For example, if Qur’an doesn’t yet fulfil your heart and mind completely, don’t replace movies with 90-minute Qur’an sessions. Instead, spend 20 minutes on Qur’an and the rest on something like (halal) fiction. A novel will fulfil your need for escapism but still stimulate your mind. In most cases, change is a gradual process. A big bang approach may yield instant results, but that success is often short-lived when we slip back into old habits. Experts preach the value of gradualism and from our own deen, we know how important it is to take things slowly and steadily. For example, maybe you spend every Saturday night out with your cousins or friends – fulfilling a need for social interaction and fun. Reduce that over time to every second weekend, then once a month. Maybe even convert some of those nights out into a small halaqah – followed by snacks or a meal. You don’t even need to prepare a speech – just play one of the many excellent Islamic lectures available online, then have a constructive group discussion afterwards. 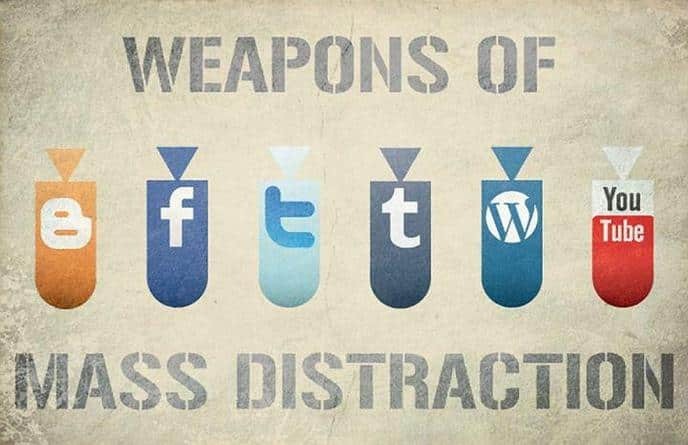 Analyse the distraction, find a solution, then put your end goal in front of you. Now plot small but consistent steps to get to your target. Even if you don’t reach that target by this Ramadan, you’re on the right track and more importantly, still better off than you were before you started making this effort. The road to success is filled with help from others, so don’t be shy to seek assistance. For example, if you’re addicted to sports or online gaming, find someone who has beaten their addiction to the same thing, and ask them how they did it. Lean on them as a means of support and you’ll find that you are not alone in your struggle, and that – with persistence and the right companionship – you can, in sha Allah, reduce or even eliminate the habit. list down what you need to do to resolve each issue: for example, send an email, fix a meeting, call the plumber, make an appointment with the dentist, etc. Last Ramadan is a distant memory, and since that month left us, the day-to-day grind of ‘normal’ life has left us vulnerable to bad habits and distractions that wear us down spiritually. But if we put in the time and effort to fight off those distractions before this Ramadan, then Insha Allah we can meet the upcoming month in the strongest possible spiritual state. May Allah help us all prepare and make the most out of the coming blessed month. Please share with us in the comments the types of distractions you are most vulnerable to and how you intend to minimize them before Ramadan, In sha Allah.